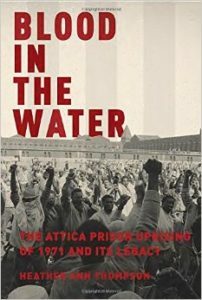 We hosted a re-broadcast of my interview with Dr. Heather Ann Thompson about her fascinating book Blood in the Water: the Attica Prison uprising of 1971 and its Legacy. Dr. Thompson is Professor of History in the Department of Afro-American and African Studies, Residential College, and Department of History at the University of Michigan. Thursday night, April 6, at 7:30 the 2640docs series returns with a screening of the 1974 film Attica by Cinda Firestone. It’s an intense and controversial film that has largely remained unseen and unavailable. The screening of Attica is free and open to the public, at 2640 Space, 2640 St. Paul Street in Baltimore.